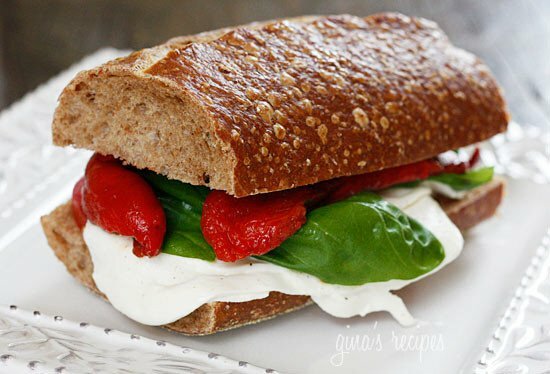 Rustic whole wheat Italian bread, fresh mozzarella, summer tomatoes, basil and balsamic vinegar. 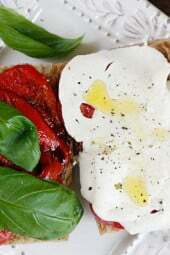 My favorite meatless sandwich! 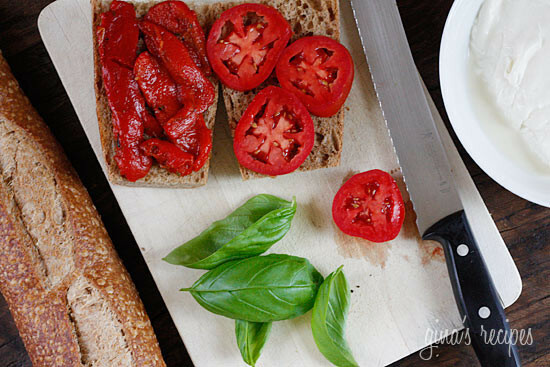 Other sandwiches I love that don’t require heating up are Prosciutto Arugula and Balsamic Sandwich, Greek Salad Sandwich and Open Faced Heirloom Tomato Sandwich. I live two blocks away from a really great Italian ravioli store called Pastosa. Aside from the best homemade raviolis they carry an amazing array of fresh breads from Brooklyn, homemade fresh mozzarella, roasted peppers, and lots of other temping goodies. It’s actually dangerous walking in there as all their mouth watering goodies are displayed right there in front of you. 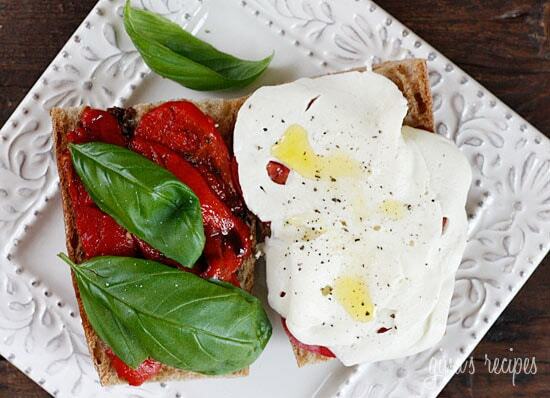 Today I had a plan and didn’t stray, I picked up some roasted peppers, tomatoes, a wonderful whole wheat loaf and fresh mozzarella, sliced thin (great trick to keep yourself from using too much as it is not low in fat!) I came home and picked some basil from my garden and put this delicious and satisfying lunch together. Cut bread in half horizontally, layer ingredients on the bread, drizzle olive oil and vinegar and finish with salt and pepper.